This was published as a Wall Street Journal’ Think Tank column on May 10, 2016. You might think that people enrolled in the Affordable Care Act’s marketplace plans would like their coverage more or less depending on whether they have a high or low deductible, or receive a subsidy to help them pay their premium. Those factors and other elements of their coverage matter, but by far the biggest difference between those in marketplace plans who say they have benefited from the ACA or been negatively affected by it is whether they are a Republican or a Democrat. That’s one finding from an analysis of a Kaiser Family Foundation survey of people covered in the non-group insurance market, which provides the clearest illustration I have seen yet of how partisanship colors people’s views of the ACA. In the Kaiser survey, which will be published next week, 29% of Republicans in marketplace plans (i.e., Obamacare) say they have benefited from the ACA compared with 75% of Democrats, a 46-point difference. There is no reason to believe that there are demographic differences between these Republican or Democratic marketplace enrollees that would explain this large of a difference in their responses. They are all purchasing coverage in the ACA marketplaces, and most members of each group are receiving premium subsidies under the law. Overall, substantially more marketplace-plan enrollees say that they benefited from the ACA (54%) than say they were negatively affected (35%). 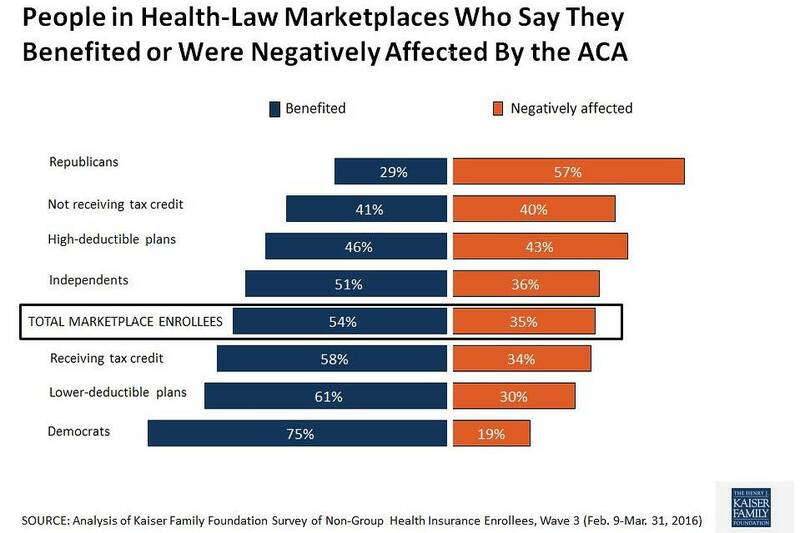 Are Republicans more negative because they feel they were forced by the law to purchase marketplace coverage? Or perhaps because they associate it with President Barack Obama, whom they don’t like? Or because they have heard bad things about Obamacare on right-leaning talk radio or cable news? Do Democrats say they have benefited because they like the president and support the law and watch left-leaning cable news? There is no way to know for sure. What is clear, though, is that the sharpest difference between enrollees in similar ACA marketplace plans is their partisan perspective. Many expected that as people gained direct experience with the ACA, those experiences would shape their views as the law evolved from a political symbol to a reality in their lives. Advocates of the ACA thought opinions toward the law would become more positive, and critics felt the opposite. Six years after the Affordable Care Act became law, partisan perspectives still seem to trump experience. It’s a reminder of the extent to which partisanship colors perceptions of policy and programs, including the ACA.